Successfully Added Car Powered FM Transmitter - MP3 Music From 87 to 107MHz to your Shopping Cart. 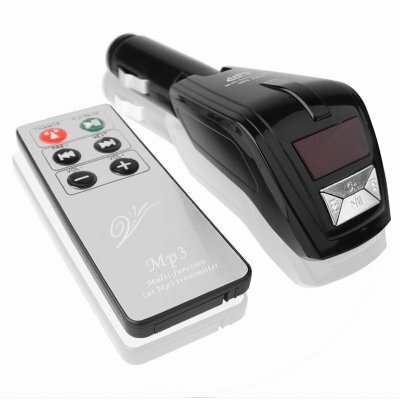 FM Transmitting MP3 Player made for and powered by any car with a standard cigarette lighter jack, and with FM transmissions anywhere from 87MHz to 107MHz. This is a nice car gadget to have when you want to listen to your MP3 music library with the great sound your Cars own audio system can provide. This Wholesale Car FM Transmitter also has a small 96x64 dot matrix LCD and a remote control for easy operation. Plug your MP3/4 Player in and see how great your music can really sound, and all at Chinavasions unbeatable low price.